I have been in more kitchens than I can count where people were convinced that “there is no food in the house” to make a proper meal. With little in their fridge, I would take a deep dive into their pantry and always find containers of grains and beans and show them that there is plenty of food! “Well I don’t know how to make that stuff from scratch” is one of the many responses I have received. If we limit ourselves to our refrigerators and our microwaves for those reheat-able frozen treasures we are only using a tiny part of our kitchen arsenal. Learning how to cook dry staples, especially beans and grains are essential to having a successful, satisfying, and affordable plant based diet. With today’s technology and most people having some sort of rice cooker, pressure cooker, slow cooker, or instant pot people have forgotten how to cook grains on the stove. Although not all are created equal, with ratios being different for each grain, the basic technique is the same. 2. 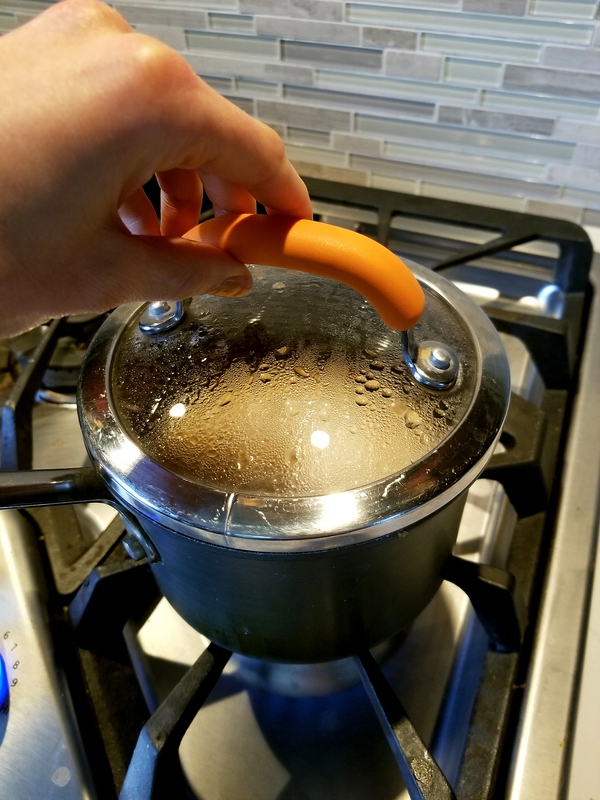 Bring grain and liquid to a boil. 3. Cover and bring to a simmer for a given time. 4. Take off heat and keep covered. Fluff and serve. If you search the internet for Quinoa recipes you will find most will call for a 2:1 ratio of liquid to quinoa. I have done this many times and have always come out with an overcooked or soggy result. 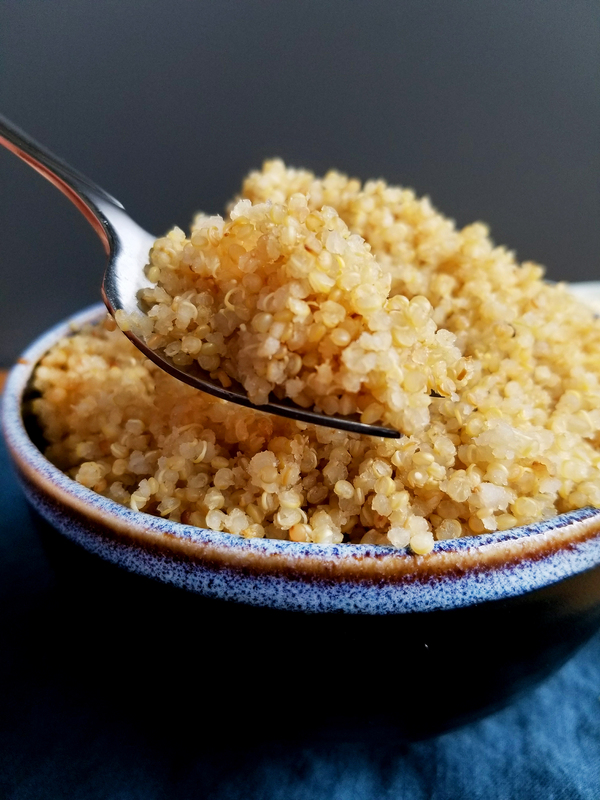 If I am making quinoa porridge I want my consistency to be more moist, and soggy even, but I am talking about achieving pilaf style quinoa where each individual grain is still intact, and fully cooked. I want it to retain its structure, so that it can take on a delicious sauce, or be mixed into a salad without becoming a paste. So instead of a 2:1 ratio, I have found that a 1.25:1 ratio works out just about every time. 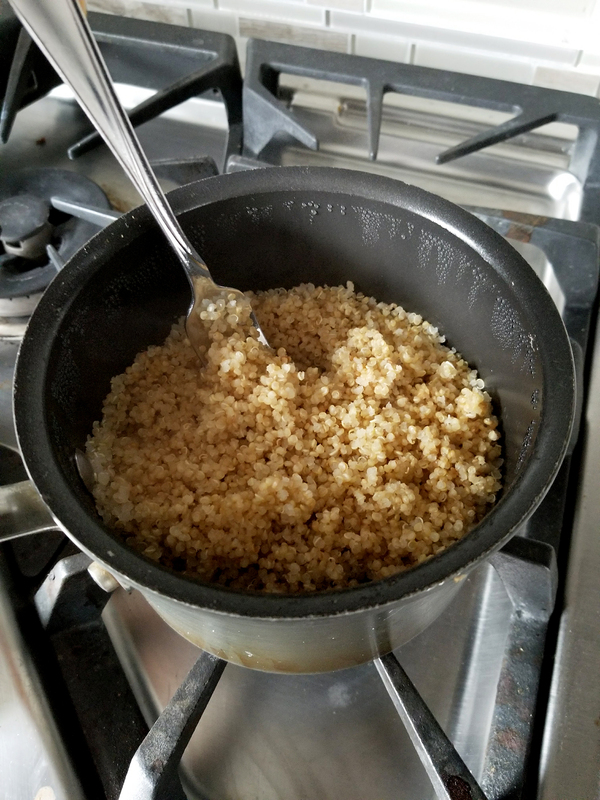 In addition to reducing the amount of liquid, I have found that dry toasting the quinoa (without oil) brings out the natural nuttiness of the food. Dry toasting also creates a sort of capsule for the grain that when properly hydrated will retain its shape. or any variety of chopped vegetables! 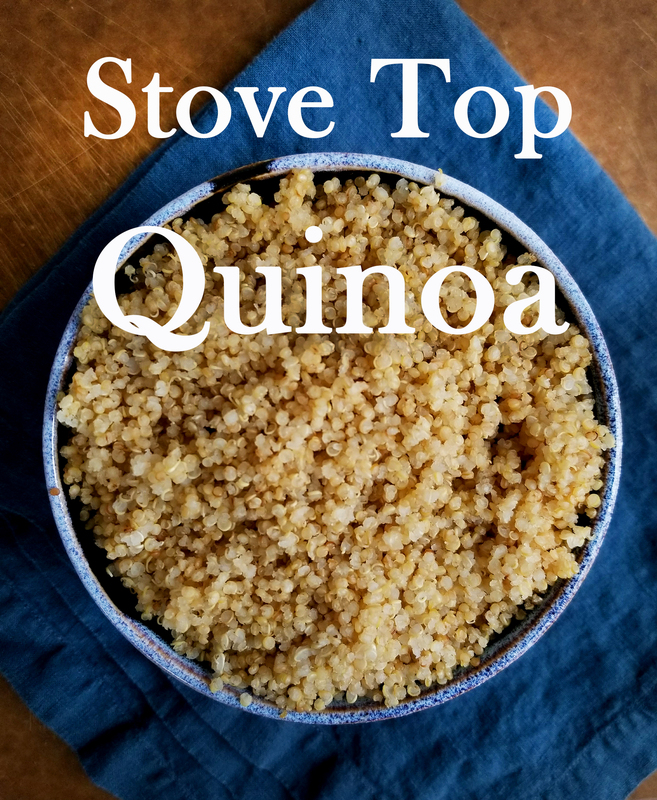 This quinoa is great for meal prepping throughout the week, make a large batch and store in the fridge or freezer to mix with your favorite greens, beans, wraps, soups, or salads. 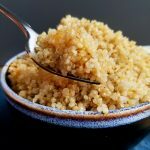 The versatility of quinoa is truly endless, and the simplicity of cooking it will keep you coming back for more! 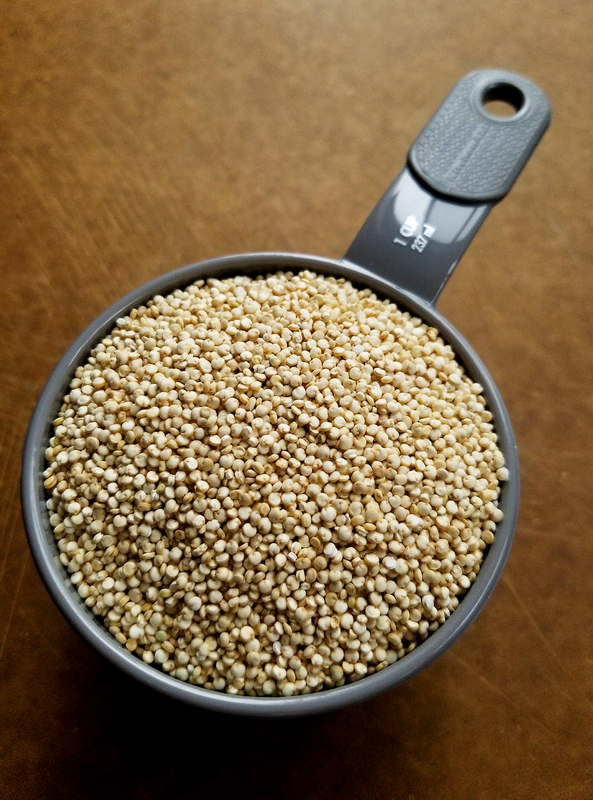 Quinoa is an adorable and teeny tiny grain, please be very cautious when measuring and pouring in and out of containers. 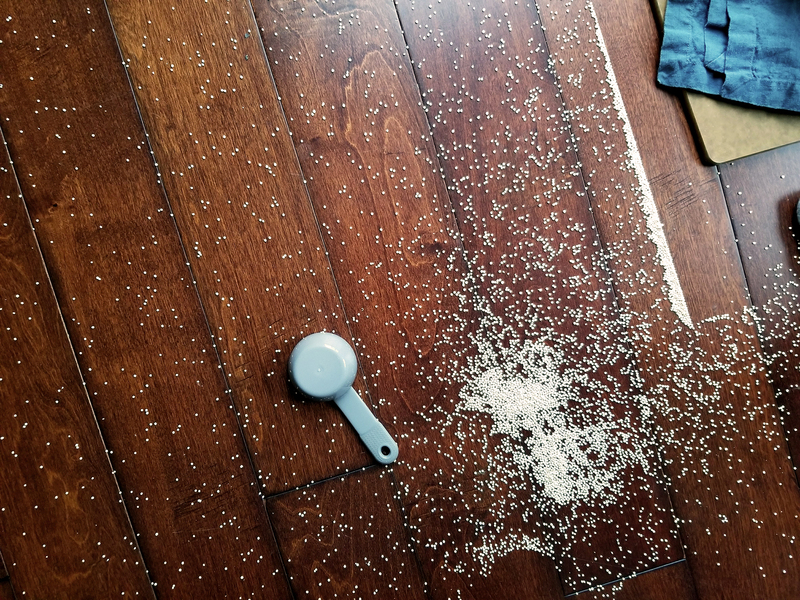 If it spills, it will go EVERYWHERE, every corner, crack, crevice, and carpet….so be prepared with a broom just in case. Don’t say I didn’t warn you! 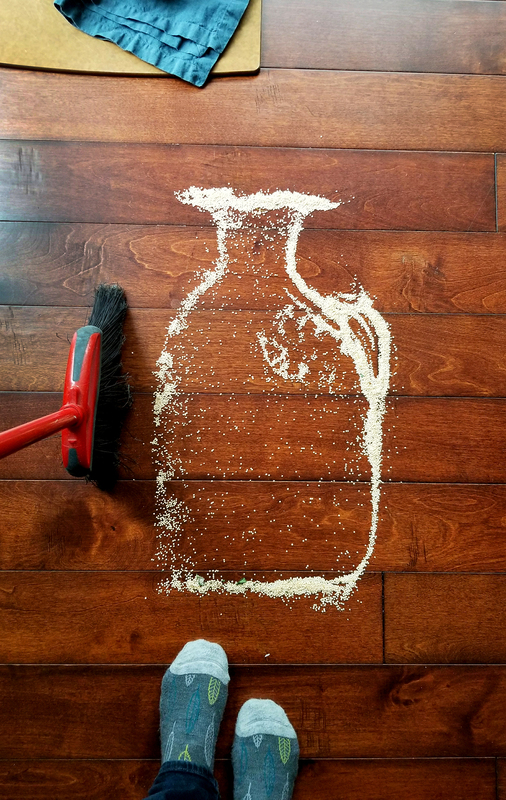 I was always told not to play with my food…but this bottle/jug sort of appeared when I was sweeping, in addition to being a great source of protein Quinoa is also a great new art medium! Perfectly cooked and fluffy quinoa. Just 2 ingredients and 15 minutes! In a small sauce pot, place the dry quinoa over medium heat and toast for 5 minutes. Using a rubber spatula continue to stir the grains so they get evenly toasted. 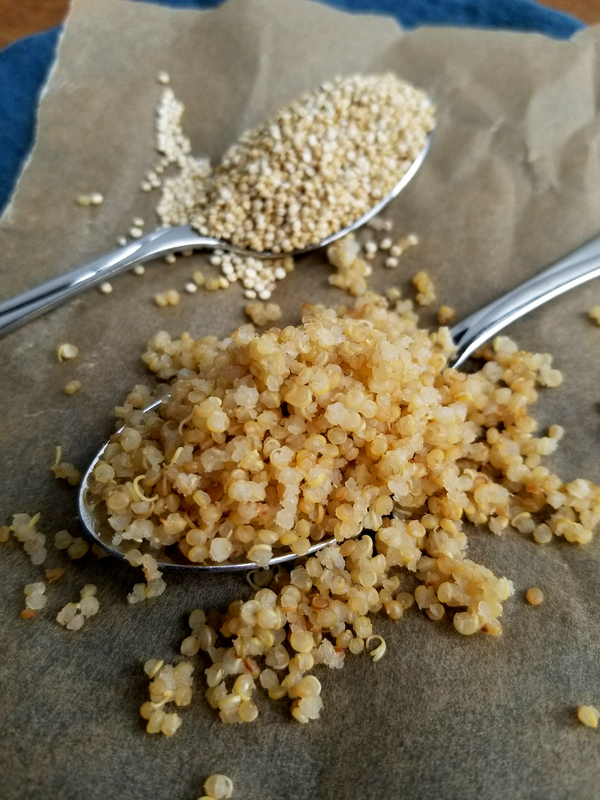 By the end of the 4-5 minutes the grains should lightly tanned (if using white quinoa) and hot to the touch, with a nutty fragrance. Add the liquid and bring the pot to high heat. 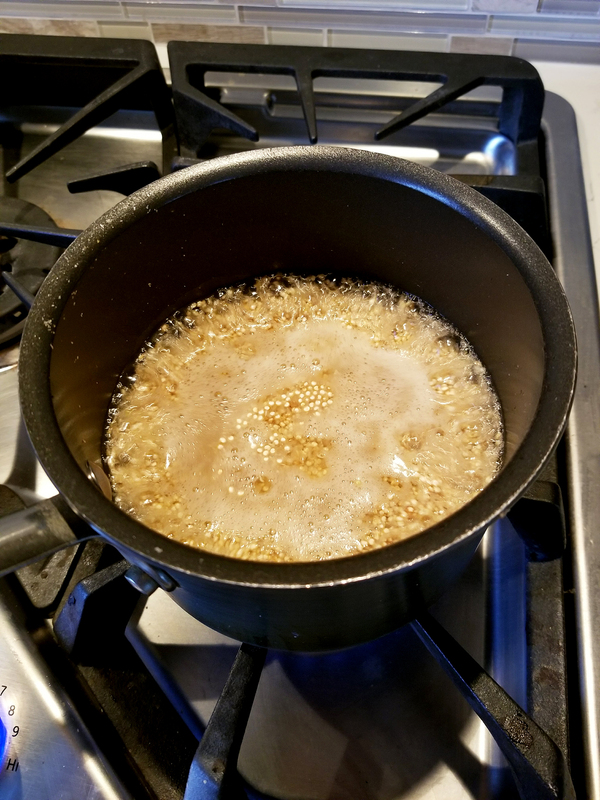 Because the pot and grains are hot it will splatter slightly, stir and bring the grains to a boil. Once bubbling, cover and reduce to a simmer. Set the timer for 15 minutes. Once 15 minutes have past, turn off the heat. Keep covered for another 10 minutes. Fluff with a fork, and cover for another 2 minutes. Serve, or let cool to store for a later meal.